In Shaman King, Anna is the fiancée of Yoh Asakura, and is an itako—a traditional Japanese shaman. Her specialty is channeling, and she can summon a spirit from anywhere, even from heaven where normal shamans can't reach. In the English anime, she is called a "spirit medium." After being abandoned by her birth parents due to her abilities, Anna was adopted by Kino Asakura. Because of this, her date of birth and blood type are unknown. Aggressive and decisive as she is beautiful and shrewd, Anna is a pragmatic person who appears cold and harsh. However, she has shown that she genuinely cares for those important to her, especially Yoh, and merely is dedicated to be "the ultimate Shaman Queen" and wife to Yoh, the first true friend that she ever had in her life. She firmly believes that Yoh Asakura is destined to become the Shaman King, and thinks that it's her duty as his fiancée to make him train hard for it. Anna's spiritual strength is shown as she was able to seal in Hao Asakura's guardian spirits (called as shikigami), Zenki and Kouki, and was able to control them. Anna and Hao seem to have an odd relationship of their own—Anna detests Hao and even slapped him once. Surprisingly, he was not angry, but actually seemed amused. It has also been hinted that Anna is the reincarnation of the original Asakura Hao's mother from 1000 years ago, Asano-Ha; others think that Hao possibly had feelings of his own for Anna and wanted her for himself, it had not been proven false because what he said to her in the manga, he said he was serious about taking her as his bride. It is obvious that Anna loves Yoh, despite how badly she seems to treat him—she said it when Yoh fought the oh-oni to save her, once to his friend Manta Oyamada, and again to Silva, a commissioner for the Shaman Fight. She broke down crying when she thought that Yoh was about to be killed while being possessed by Tokagero. Anna can be extremely possessive of Yoh, beating him up once when she thought that the Oracle Bell he brought home was a woman's pager. She also reacted jealously when Yoh asked Tamao Tamamura to cook him a meal in the anime. Once, when Yoh was thought to be dead after Hao stole his soul, Anna was in hysterics, and only recovered her strength when Yoh returned. Anna attends Shinra Private Academy along with Yoh and Manta. Her favourite singer in the manga, Ringo Awaya, is a reference to Japanese singer and guitarist Shiina Ringo. Anna is also the mascot of the Aomori prefectural police Takei, Anna's creator, was born in Aomori. 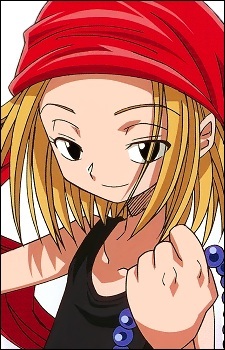 In Shaman King, Anna is also born in Aomori. Anna is married to Yoh and the two of them have a son six years old named Hana Asakura.